The WSU values struggles of the past, asserts rights in the present, and celebrates aspirations for the future. To develop a greater awareness in the Florida State University community of the nature of women's problems and their relationship to the economic, social, and political nature of the American Society. To promote the growth of a positive approach towards women's concerns in the Florida State University community. To develop programs, services, and activities that will reach out to women. To build a spirit of camaraderie among women so that a feeling of strength and solidarity can be fostered. To actively confront sexual discrimination in the Florida State University. To lobby the University Administration regarding policy and security issue that affect women. The Women Student Union fosters the growth of women personally, professionally and politically. The WSU will celebrate the power existing within every woman to promote self-autonomy, denounce all limitations, educate on systems of oppression and advocate inclusivity within a diverse community. WSU facilitates a network among organizations, departments, and services to embrace, engage and empower. The Women Student Union is an identity-based group within Student Government whose overall mission is to unite women on the common purpose of individual self-growth. WSU places emphasis on addressing the issues collegiate women face and proving the forum in which they can be enlightened and empowered. It is our sincere hope that a spirit of camaraderie and a sense of strength and solidarity can be fostered month the women on our campus. As a representative voice, the Women Student Union prides itself on being an open and diverse group, available to every student on campus. We encourage you to get involved and find out what we have to offer! 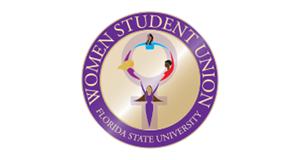 Women Student Union, is located on the fourth floor of the Thagard Buildingm and is open to all Florida State Students. We hope that you will stop in and say hello!"